Welcome back! 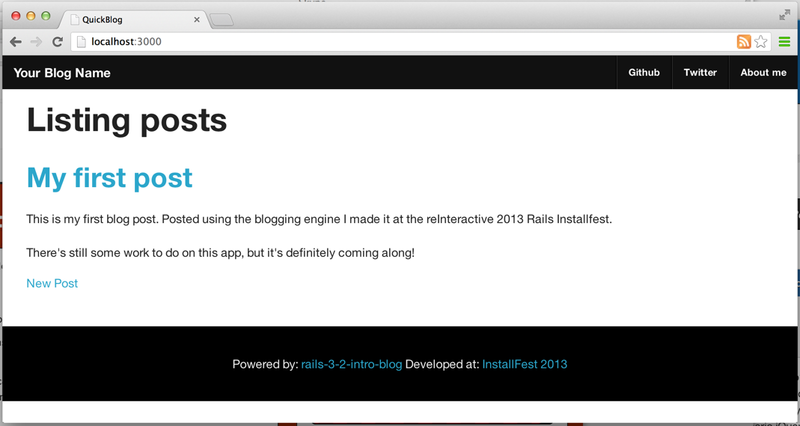 In the previous article you built a simple blogging engine using Rails and published it up on Heroku. If you haven't run through that post then you should do so now before starting this one. In this installment, together, we'll add some features to your blogging engine, show you more about Rails and make it look nicer using Zurb Foundation. Let's dive in. 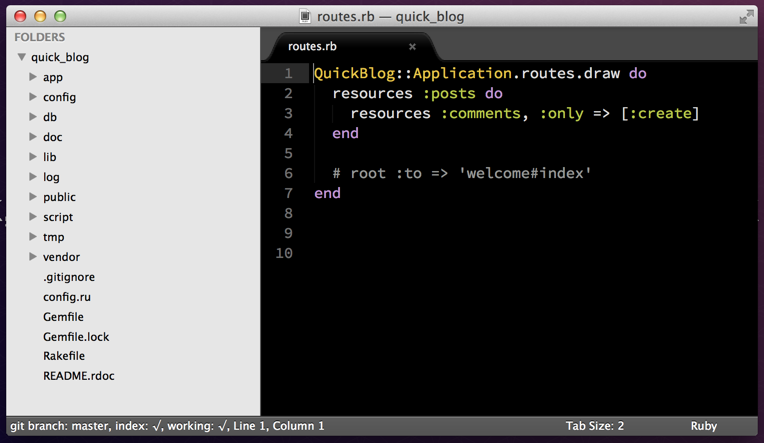 First we want to start our Rails server, so open two terminals and change to the directory we're developing our app in. In one of our terminals start the Rails server with rails s (s is short for server). Next start Sublime Text and open the folder that your app is stored in. By doing this you get to see the directory structure of Rails in the sidebar so you'll be able to navigate around your project a little more easily. Currently our site only shows the posts if you navigate to /posts. This is all well and good, but if you go to the "root page" of the website at http://localhost:3000 you get the "Welcome to Rails" page. Obviously, if we want people to start reading our blog, it would be good if we show the blog posts we have immeidately when they come to our site, without having them navigate elsewhere. To set the root page of a Rails application first you need to delete the "Welcome to Rails" page that is located at public/index.html. The way we're using the root method here indicates that we want the root path of our application to be sent to the PostsController index action which you created in the previous article. 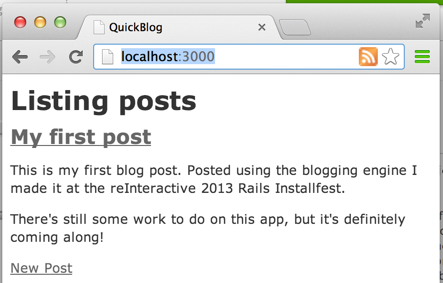 If you open http://localhost:3000 you'll see your posts index rather than the boring default Rails page. git commit -m "setting a root page"
And then you can deploy to Heroku with git push heroku master. You'll be able to navigate to your blog on Heroku now to see the changes you've made. Adding that the remote flag to that method call means that Rails will automatically set up that form to be submitted via AJAX. If you refresh the post view page and try to submit a comment you'll notice that nothing happens, however if you switch to the terminal running your Rails server you'll be able to see that the request was received by the server, it's just doing the wrong thing with that request. The last line of the log here indicated that the server redirected to /posts/1 as the response. We don't want that behaviour for an AJAX call. git commit -m "comments can be submitted via ajax"
The next feature on our list is to implement an RSS Atom feed. Once again Rails makes this job pretty simple. We'll be outputting our list of posts in an Atom format rather than a HTML format. If you open app/controllers/posts_controller.rb you might notice that already the index method will respond to the JSON format. We can see this in action by going to: http://localhost:3000/posts.json. You'll see all your posts rendered in JSON format. 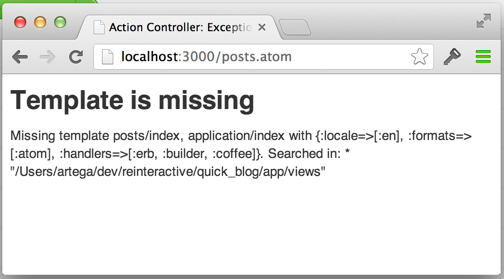 If you goto http://localhost:3000/posts.atom you'll receive an error that the template is missing. feed.title "InstallFest 2013 Quick Blog"
You might want to customise your ATOM feed by changing the name of the blog, or by changing the author name to your own. Refresh the http://localhost:3000/posts.atom page and you'll see the XML being returned properly. To test this you might like to temporarily install this plugin to Google Chrome and reload any page on your blog site. This layout file is used to wrap every view in your application so changes made to this file will affect every single page in your application. After you load up any page in your blog you should see an RSS icon in the URL bar. Clicking it will take your to your site's RSS feed. git commit -m "adding atom feed and autodiscovery"
Up until this point we've really neglected the look and feel of your blog. It definitely feels a bit boring! We'll be making it look much nicer by using a UI library called Foundation. Foundation is similar to Twitter Bootstrap, but is slightly more compatible with Rails. Foundation is built using Sass while Bootstrap is built using Less. You can run Less in Rails, but it has some compatibility issues with Windows so today we'll be using Foundation. After you've saved that file, switch to your terminal and run: bundle install --without=production. We're going to skip installing the postgres gem in our development environment since it's likely your computer isn't set up to build it properly. Make sure at this point you also restart your Rails server, so switch to the command prompt where Rails is running press Ctrl-C and then restart it by typing rails s.
Press n and then enter to skip overwriting our application.html.erb layout file. By skipping this we do miss out on some of Foundation's responsive design features, but we've already added our RSS link to our layout file and allowing the install to overwrite our layout file would mean we'd lose that link. If you're comfortable putting the autodiscovery link tag back into the new layout file, rerun the foundation install and allow it to overwrite your layout. You'll also want to remove the scaffolding css file that Rails provided to you when you scaffolded the Posting functionality. To do that just delete app/assets/stylesheets/scaffolds.css.scss. Refreshing your browser or navigating to http://localhost:3000 at this point will show some changes to the UI of your blog. Changes all inputs with a type of submit to use Foundation's button styling. Targets that div#main you inserted into the layout file and gives it Foundation's grid-row behaviour. Sets up some footer styling that we'll be using in a later step. After this you removed the requiretree directive from the application.css file. This directive causes your application to stop automatically including every CSS file in the stylesheets folder. Immediately after this we import the new common.css.scss file into the foundationand_overrides file so that our newly created CSS rules will be applied to our blog. We're doing this to inform Rails' asset pipeline that we'd like to use SASS to import the file, rather than relying on the asset pipeline's catch-all method. This gives us slightly more control over what gets included and also causes Foundation's mixins to work correctly. You can read more about the asset pipeline on the Rails guide site. git commit -m "adding zurb foundation"
Your blog works, it has posts and comments but it doesn't feel like your own. We're going to add in a header and footer which will allow users to navigate a little more easily and will give you the chance to personalise your blog a bit more. In all web-pages the header and footer are generally common across all pages, Rails gives us a layout file that lets us make these sorts of changes to every page at once. Refresh your browser or navigate to http://localhost:3000 to see the changes you've just made. Feel free to no go ahead and edit the header and footer html files now to make your blog truly personal. git commit -m "adding header and footer"
You might notice a few things you want to change about the application. While some things are easy, others will require more effort or possible some assistance from a mentor. Q) How do I make the About me link work in the header? A) There are a couple of ways of doing this. You can alter the link so it points to /about.html and create a file in public/ or alternatively create generate a controller and wire up a route to an action in that controller. You can read more about this in the routing guide and the action controller guide. Q) There's a bug that lets a user submit blank comments! Q) I want to have proper user logins for both creating a post and submitting comments. A) You can use a gem like Devise to do this, it can be a bit complicated though. Ryan Bates has done some excellent screencasts on Devise and Authentication from Scratch. If you're keen to learn more about Rails you should subscribe! Up next is a guide on testing your 15 minute blog. Click here to check it out and continue your Rails adventure.